I am a doctor, “rejuvenating” corporate executive, entrepreneur, author, and speaker. My wife (Jill), our two-and-a-half-year-old daughter (Joie), and our golden retriever (Sunny) live in Tampa Florida, Newport Beach California, and Vancouver, Canada (so we travel a lot). 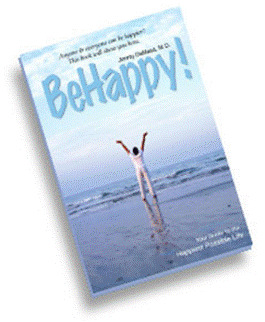 I would love to hear from you on either how your life has improved by using the BeHappy! system, or how I can help improve your life more by making the system even better. Please go to BeHappy101.com (or see the yellow box at the end of the newsletter) to provide your comments, suggestions, stories, or thoughts and I’ll respond to you personally as soon as possible. Here’s to your happiness and to having the kind of life you want to have! Can we Raise Happier Children? The purpose of this newsletter is to provide a regular and consistent supplement to the action-oriented process described on my website - www.behappy101.com - and in my first book, simply called BeHappy! Smiling releases endorphins and makes us feel better. Even “faking” a smile can lead to feeling happier. Several studies have shown that a pet can reduce blood pressure and stress, promoting health and happiness. According to a new look at a 40 year old study on child rearing practices conducted at Harvard University, those children who were hugged and cuddled more grew up to be the happiest adults. The 3rd Happiness Fact here indicates that children who were hugged and cuddled in their early years tend to grow up to be generally happier people. Also, in the February 2009 edition of the BeHappy! Newsletter, one startling fact listed was that the fastest growing segment of the anti-depressant drug market is pre-school children! Can you believe that? Even worse, the incidence of depression – and even suicide – amongst high school kids is unacceptably high ... and getting worse. Although this is unacceptable, it's not too surprising, given the fact that, in the US - clinical depression is 3-10 times more common today than two generations ago. Yes, something must be done to create more happiness in our world. And it appears it could start with the raising of our children. We must make our children happier, more fulfilled and more balanced. We must reduce the depression and suicide rate amongst kids. And we must reduce our dependence on drugs to help make kids – and adults – happier. All this is possible. And it’s somewhat of a “domino effect”, because happy children tend to help influence other children. And happy children have a much better chance of growing up to become happy adults (so there would be more happy adults). Then, happy adults tend to raise happier children, and so on. It perpetuates itself to the point where, perhaps, 50 years from now people will be happier than they are today - a trend reversal! If you have children – especially younger children (say under the age of 13 or so) – what do you do for them to make them happy children? And by “happy children”, I mean for the long-term (in other words ... not the brief joy they might experience by buying them something or letting them do something they want to do). For example, do you have lots of rules for your children? In my book, BeHappy! I devote an entire chapter to the subject of rules. Why? Because it’s so important to our happiness - whether a child or adult. Do you have lots of rules for your own life? If so, how were those rules created? Many were probably developed based on your upbringing. Rules – especially differing rules between people – create conflict. My former business partner, Tony Robbins, says that “every upset [argument/disagreement] between people is a ‘rules’ upset”. And with children, it is my opinion that establishing too many rules early on sets them up for increased conflict, pain, and, yes, unhappiness in their lives. So, just like with our own lives, instead of creating and living by too many rules, we should establish guidelines for our children instead. Sure, children need “boundaries”. It’s just better to make as many of those boundaries as possible somewhat broad (which is the main difference between 'rules' and 'guidelines'). It will provide them with a sense that you trust them - especially as they get older. It will help them get along better with their peers (since their peers won't be breaking as many of their rules because they won't have as many as those children with lots of rigid rules). That's the true basis for reducing conflict and anxiety - both at home and away from home. With fewer rules, there are fewer opportunities for our rules to be broken by others, which instills higher self-esteem, greater peace-of-mind, and a broader feeling of connection. These are all things which can help build a happier mindset, a more positive overall attitude, and a happier life! Like everything in life, the old saying, “practice makes perfect” applies to happiness, too. By using the tools and concepts in BeHappy - and applying the principles on my website (www.behappy101.com) and in this quarterly newsletter - you'll have the coaching and the “practice” you need to lead the happiest possible life. It takes daily action to get “perfect” at it, though. So every quarter in this section of the newsletter, I’ll provide some simple exercises for the next two months (until the next edition of the newsletter) which will relate to the main "subject" of this edition of the newsletter and help make happiness a habit. Use the process described in BeHappy! to change rules to guidelines. And, if you have children between the ages of 13 and 18, you might consider doing the same thing as above. Or, as an alternative, just sit down and talk with them about their overall happiness. Are they happy most of the time or not? Do they get “depressed” frequently? What makes them happy or sad? Finally, if you don’t have children, you might consider helping your friends out with this concept to make their children happier – because ultimately, it will help you and your family and friends by making our world a happier place. Or if your children are grown and have their own children, you might focus on helping their kids this way. Because it is becoming more and more apparent that too many rules creates low self-esteem, bitterness, and unhappiness in children. That’s at least part of the reason why anti-depressant use, depression, and suicide are on the rise in kids. You’ll find all this – and much more (and in much greater detail) – in an upcoming article on the BeHappy101.com website about raising happier children coming out later in the spring (I’ll let you know exactly when in the next edition of the newsletter if it hasn't already been released). For now (and for this next 60-day period) just get this process started by doing some of these basic things to help raise your children to be as happy as possble. If nothing else, just talking to your kids about these types of things can help establish better and more open lines of communication and a feeling of caring and support. And if you have really young children – under the age of 5 - make sure to hug and cuddle them a lot. According to the Harvard study mentioned in the "Happiness Facts" above, they’ll be more likely to become happier adults if they are just hugged and cuddled more. PART TWO of an effective new goal-setting process for establishing and achieving goals. Part 4 of the “financial” series called, Overcoming Fear to Thrive in the Current Economy, which is intended to help us all get through the difficult economy we are experiencing in 2009. Thought for Today - a feature on the site initiated February 1st which has provided a new thought every single day since then. Each new Thought for Today gets posted on the behappy101.com homepage every morning (365 days of the year) around 5:00 a.m. (unless I sleep in – then it might be 6:00 a.m.). These are thoughts to help start your day off right. The thoughts are generally about happiness, success, relationships, money, etc. So go to the website everyday for a new “thought”. You’ll soon become “addicted” – and it will improve your life tremendously.